HELEN Evans is proof the Rotary Bowelscan program saves lives. Five years ago the Maleny resident bought a test kit from her local pharmacy and was shocked to get a positive result. "The shock was immense," Ms Evans said. "But thanks to the Rotary program my life was saved through the early detection of the cancer and subsequent operation." 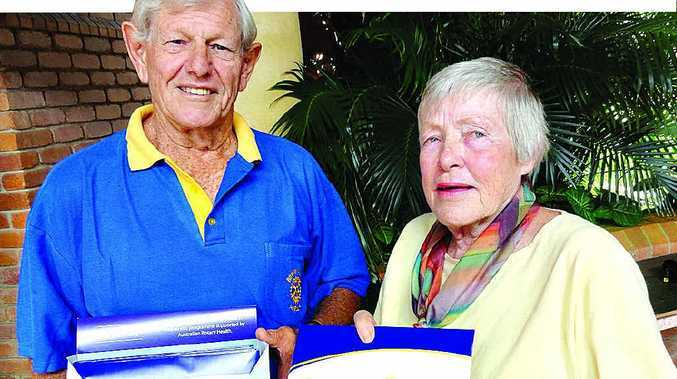 The 76-year-old encourages Sunshine Coast people to pick up a Rotary Bowelscan test kit annually from their local pharmacy. "I think Rotary is doing the most amazing job promoting this testing regime and people should take advantage of it. "People always think it is not going to happen to them - but it could." Have you been tested for bowel cancer? This poll ended on 10 May 2016. No. I'm too young, right? Yes but it's been a while. Yes and I get regular tests. A Sunshine Coast Rotary spokesman said bowel cancer resulted in more deaths than breast cancer or prostate cancer each year. He said about 4000 deaths occurred annually from bowel and colorectal cancers. "Early detection is the key," the spokesman said. "Unfortunately the later the cancer is detected, the less chance of recovering from it." The simple test kits are available this month from participating pharmacies across the Coast for the price of $15. A new type of kit is available this year, which is easier to use and includes a prepaid envelope to mail the sample direct to the accredited laboratory. For inquiries, phone1300 779 694.